Roto-molded polyester shell, filled with foam, molded centreboard box, mast box and fin box, molded anti-slip deck. Wedged base with two stainless screws, based on Waveset design. 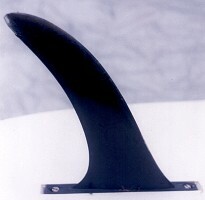 For second generation Windsurfer fin, see below. 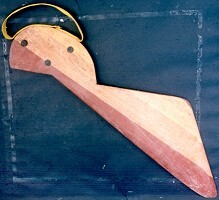 In the early 1960s, S. Newman Darby developed a sailing board incorporating a pivoting square rig which he tested on on the Susquehanna River, Pennsylvania. In 1964, he began selling his sailboards and a promotional article by Darby was published in Popular Science, August 1965, Vol. 187, No. 2, pages 138-141. 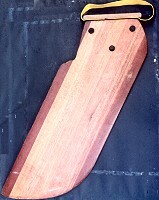 The standard board was a rectangular box, built of plywood, and although there was a retractable centreboard, there was no fin, or rudder, and it was sailed with "your back to the lee side of the kite shaped square sail." 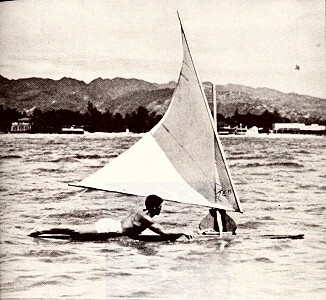 Also note Hands-Free sailing technique of Bigler?, in Hawaii, circa 1967 in Dale Davis' The Golden Breed, 1968. Also note the interest in Surf-Sailing, initially by Woody Brown's catamaran at Waikiki circa 1940 and Hobie Alter's Hobie Cat, circa 1966. 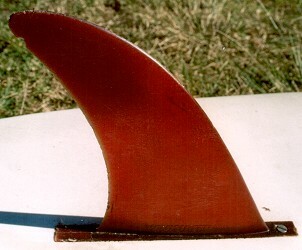 Original rig design was patented in 1968 by Jim Drake and Hoyle Schweitzer (see below), the board was based on mid 1960's standard malibu board template. Initially little interest was shown in the USA, but the design proved popular in Europe, essentially as an alternatine to small sailing boats. In Hawaii, a small committed group radically pushed the design to it's limits in the surfzone, and in a short period had introduced the rubber universal, harness and footstraps and eliminated the centreboard. Early design was focused on board and fin shape, producing a virtual menagerie of variation. By 1988 board design had relatively stabilised and the large manufacturers invested in producing lighter and stronger boards in epoxy resins. This period also saw dramatic advances in sail and rig design. 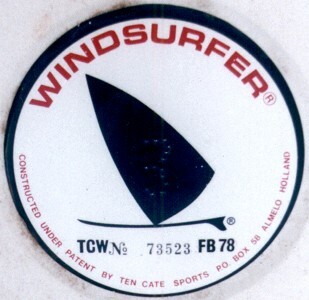 The influence of surfing on the development of the Windsurfer is well documented. 1.The successful application of expoxy technology to surfboard manufacture has only been possible by accessing the expensive and difficult advances made by the sailboard industry betwen 1980 to 1990. 2. The development of tow-in surfing on the outer reefs of Hawaii was preceeded by extensive ''testing'' by sailboarders, essentially the same crew that pioneered tow-in. The use of footstraps being a crucial factor. Montague House, Rusell Square, London WC1B 5BX 1983.